(Verse 1) Children of the heavenly Father safely in his bosom gather; nestling bird nor star in heaven such a refuge e’er was given. (Verse 2) God his own doth tend and nourish, in his holy courts they flourish; from all evil things he spares them, in his mighty arms he bears them. (Verse 3) Neither life nor death shall ever from the Lord his children sever; unto them his grace he showeth, and their sorrows all he knoweth. (Verse 4) Praise the Lord in joyful numbers, your Protector never slumbers; at the will of your Defender every foe man must surrender. (Verse 5) Though he giveth or he taketh, God his children ne’er forsaketh; his the loving purpose solely to preserve them pure and holy. (Verse 6) More secure is no one ever than the loved ones of the Savior; not yon star on high abiding nor the bird in home-nest hiding. At the close of the service, we played a video that I had prepared. I hope to perfect, and then upload the video to youtube soon. I will provide a link hopefully in a couple of days. It moved most of the people in the room to tears. My morning preparing for the service was extremely hard. It wasn’t so much the work of cleaning and organizing; it was pulling out all of Mercy’s memorabilia and setting up her little display table. Nearly the entire time I was doing it, I was doing it through tears. I kept thinking that she was suppose to be here. She is suppose to be filling her pink little dress and her pure white blanket with her body, not a wood box containing her remains. Karie looked beautiful. She was wearing mostly black and spent much time hundered down in her recliner that is nestled in the corner of our living room. During the service, Elsa (our 3 year old) and Sammy (our 4–1/2 year old) snuggled into each corner of their momma’s side. They were her shield and hiding place as her desire was to disappear from all eyes that may be looking at her. After the service we ate a marvelous meal that was provided for us by a kind and sweet lady at church named Lila. She proved herself to be an excellent cook; both in taste and presentation. We were so blessed to have had her prepare this meal. We even were able to graze off the remainders today (Monday) for lunch. After our family left, we reminisced in the living room with our dear friends the Mindrups. Chrissy is the one who flew in from Kentucky to be here for Mercy’s birth. Jamie (her husband) drove up all day Friday and surprised us at the hospital on Saturday morning. We laughed, reflected, and cried the tears that were bottled up during the service we had hours earlier. We miss our sweet Mercy and desire with every ache of our heart that she was here with us. I will see how many thoughts I can articulate while half the kids are napping, the other half are journaling in their room, and Karie is resting in the living room. Our son Justus, a year earlier, had died sometime in the early parts of the second trimester. Karie was induced and gave birth to a perfectly formed 4" baby boy. He was truly an amazing sight to behold. Intricately woven in his mother’s womb. Perfect, except the one essential part of earthly existence; a heartbeat. This event shook our family to the core. Karie went into a pit of despair. She knew that her hope, strength, and joy were to be found in the truth’s of Scripture. She would daily kneel before the throne of grace but could not find the help she needed. She knew that she was despairing, but also knew that she could not get herself to climb to the light herself. She needed to wait. We needed to wait. Me and the kids were also grieving, but not at the level of a Mother who had just lost her son. It was hard to find the patience to wait for God’s timing. Yet we had no choice. I wanted my wife back and the children desperately wanted their mom. Months went by and my beloved found her God. He brought his Spirit out of the Word and revived her soul. I remember the day she said yes when I asked her if she felt stronger (in faith) then before the loss of Justus. We all were so thankful to have her back. Summer soon rolled around and the family was outside enjoying the warm weather. I was pushing the kids on our swing set when Karie approached me. She told me the pregnancy test she just took was positive. I asked her if she was positive, and she replied that she had taken multiple tests to make sure. I was filled with joy. Karie was filled with worry and fear. As the weeks went by, Karie found it hard to hope. She wanted to believe that the Lord was going to give her another child to have and to hold, but didn’t want to have that hope destroyed by another shocking loss of life. We went to a couple of appointments and heard our baby’s heart beat. The mid-wife even encouraged Karie to stop by weekly without appointment just to hear the sound of a beating heart. She did that a few times and the heart continued to sound triumphantly. Karie dared to let herself hope. She had passed the dreaded time of Justus’s loss and her shield of defense was dropping. When the time came for our twenty week ultrasound, we brought our oldest two girls, Ali (our 15 year old), and Rylee (our 13 year old girl), so that they could enjoy the blessing of seeing their baby sister or brother on screen. During the appointment, the ultrasound technician was doing their normal checks. We were not alarmed in any way and learned that we were having a baby girl; our fourth. The technician told us that she needed to do a couple more checks and that Karie should go and empty her bladder. As the technician parted with Karie, she told her she needed to go and check something and would return shortly. When Karie came back into the room, I told her that I was going to head off to work. I kissed her and the girls, praised God for a healthy and whole baby girl, and headed down the road. I was not five miles away when I received a text from Ali. It simply said, We need you back here now. I had no idea what could possibly be wrong. My mind swirled in a hundred directions as I headed back to the hospital. When I arrived, Karie and the girls were in the waiting room outside the clinic. I knelt next to my wife and asked her what’s wrong. She cried and said she had no idea. We waited for a few minutes and were ushered into an exam room. Our mid-wife came in minutes later and gave Karie a hug and told her she was so sorry. Karie told her she had no idea what was going on. Susan (the mid-wife) told us that our baby had something seriously wrong with her brain. The frontal portion was completely missing and there seemed to be some deformities. She scheduled us for an ultrasound with a specialist in the cities. She left the room and the three ladies around me cried. The drive to the cities was quiet. We were anticipating that our baby girl would be severely deformed and handicapped. Life was going to change in a major way for our family, but none of us knew exactly how much. During the next ultrasound we found out more details. Our baby girl was missing so much of her brain that she would be incapable of living for any length of time. She had six digits on each hand and foot, and had major deformities on her face. The condition, we were told, was called trisomy 13. She had somehow inherited an extra chromosome that the doctors said made her incompatible with life. We were asked if we wanted to terminate the pregnancy. We found out that there are few children who are ever seen with trisomy 13. Nearly all of these babies are aborted before they could ever be loved on by their parents. This was not an option for us. As hard as it would be, we could do nothing else than press on. We walked out of the clinic in silence and headed for our van. Everyone got inside except me. Before I opened my door, I looked up to the heavens and said I’m done Lord, I’m done! My heart was becoming hard. I wanted to know why. Within a day or two of that news, Karie asked me if I would blog about our journey. I still find it amazing that my beloved, who is really a private person, would want to share our intimate family struggles with the world around us. There have never been many readers of this blog, but it is the one outlet I have. I think now it may be for two reasons. She wants to let the power of God be on display in our weakness. And she knows that I express my thoughts best by writing them out. We decided to name our baby girl Mercy. A friend had written an email to Karie after she heard the news of her trisomy 13. She told her that in the Bible, mercy always followed justice. We loved that so much, we adopted that as a perfect name for our daughter. Over the next couple of months we struggled though many things. Personally I was wrestling through what it meant to be made in the image of God. What was the purpose of prayer. Would we be able to look upon our baby girl with eyes of love, or would we be disgusted by the sight of her. These were hard things indeed. The Lord has a way of forcing us to hold onto beliefs we profess to ascend to when times are good. As time went on, my anger subsided and I offered Mercy back to God with an open hand. After all, wasn’t Job the first one to say that the Lord gives, and the Lord takes away; blessed be the name of the Lord. The Lord had given us Mercy. It was surely within reason to believe He could take her back at any given moment. Karie did not sink into despair like she did with Justus. She found her sanctuary in the words of Scripture. This time the Spirit of God was not absent from the words, but rather a very present help in this time of need. I mostly found her nestled in the book of Hebrews. She found a Bible study by Nancy Guthrie called; Hoping For Something Better. She poured herself daily into the Word through this means. God poured himself daily into her though these means as well. Twentynine weeks turned into thirty. Mercy was not consuming fluid like most babies in the womb. Excess fluid began to make Karie so uncomfortable that she could hardly move. We moved from our midwife to a Christian doctor in the cities; he had delivered Justus. We had another ultrasound and were able to see our baby girl again. Karie was thirty weeks and measured as if she were thirty-six. We scheduled an appointment for two weeks to induce Mercy into this world. In those two weeks, Karie increased in size all the more. When we finally delivered Mercy on January 23rd, Karie was measuring as if she were 42 weeks pregnant. Thursday January 22nd I worked a half day. This was the day we were heading to St. John’s Hospital. They would begin the process in the evening and start inducing labor in the morning. Karie’s dearest friend Chrissy flew in for the delivery. She had been here during the birth of Justus and knew she could not be kept away from being here again. My beloved and I had dinner at Panera Bread before we checked in. We arrived soon afterward in the parking lot of the hospital. I looked at the clock, and then at Karie. She closed her eyes and said she did not want to go inside. I told her I could write a blog post while we wait. She told me that it should be a long one. The doctor measured Karie when we arrived. She exposed her beautiful belly to the fluorescent ceiling light. As the doctor stretched his measuring tape across, he exclaimed “that’s a big tummy.” This coming from a doctor who delivers babies for a living. That evening, Karie had four friends come by for love and support. They were in our room for around three hours. It was such a sweet time of reflecting, laughing, crying, and praying. Karie felt so loved on during this time. Friday morning dawned and the process began. A couple of checks happened before the doctor was comfortable enough to break Karie’s water. When he did, 12 pounds of fluid came flooding out. We know this because Chrissy made Karie weight herself soon afterward. Almost instantaneously Karie began saying, “oh I can breathe, I can breathe.” She had been uncomfortable for so long, that this relief caused her to fall into a much needed, and deep sleep. During the times of waiting, we played a chosen selection of songs that have been meaningful during these times of carrying Mercy. I wrote and posted updates while Karie rested. Chrissy rubbed Karie’s back, took her for the occasional walk, and prayed. She was such an incredible source of comfort to my dear wife that my words cannot provide due justice. 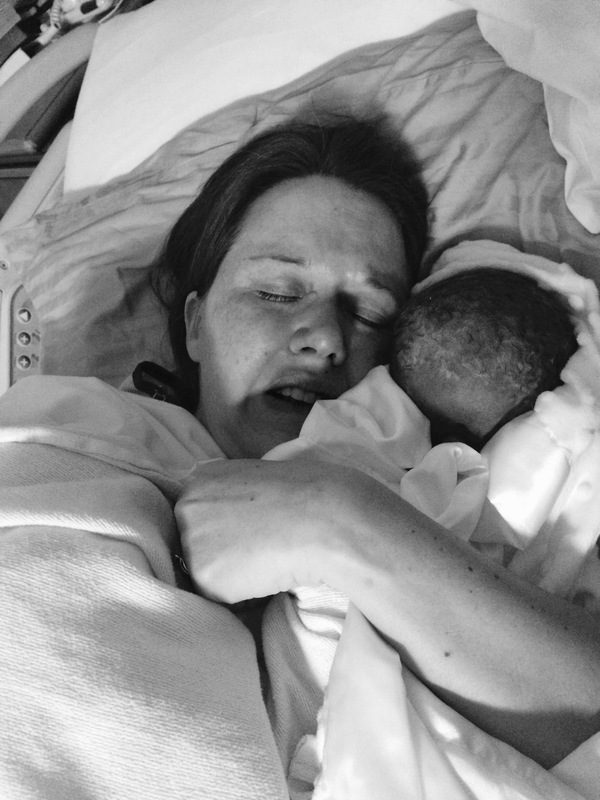 Karie had prayed that God would provide the perfect nurse during the delivery. She had been fearful that our nurse would not have the right response to the condition of Mercy. We did not know exactly what our baby girl was going to look like and wanted a nurse who was compassionate and understanding. In the providence of God, he sent just a nurse. Her name was Necole. She had delivered a baby with trisomy 13 ten years earlier. She had an abundance of compassion and mercy. Karie told her at one point that she had prayed for her. I was not sure that Necole understood this and so later on I told her that Karie had prayed for a nurse that would be compassionate and perfect for our needs. I told her that God chose her and she was an answer to our prayers. She indeed was. I know this is a rather abrupt ending to this post. My intention is to write our story in full, yet I see the time it may take will be longer than I can accomplish during the kids nap time. Please don’t go away. I desire for God to be placed on display amidst our story of Mercy. To be continued another day. Blessings through Christ to you. Thank you for sharing, Scott. God IS being glorified through your story! Thank you for these posts! I have been able to read what was happening prior to Mercys birth and learn Justus’ name. Most importantly though, reading the words of a grieving husband and father has helped me better understand how my husband grieved the deaths of our babies. I read so many grieving moms’ words but don’t recall ever coming across a grieving father’s blog. I have been blessed to read yours. Praying each day for you all!